You’re jetting off on a wonderful villa holiday, where golden beaches, picturesque scenery and tasty local delicacies await. Your villa’s all set for your arrival. With your private pool, glistening in the golden sun and all those home comforts that make for an inviting retreat. But why not use it as a base for an adventure? Adding a car to your package gives you the freedom to explore. You’re free to road trip along scenic routes, drive to hidden gems and venture off the beaten-track. Villas with car hire let you create even more treasured memories. This is a holiday where you’re definitely in the driving seat! Our villas are located in unforgettable areas across the world. From the Algarve to Antigua and Spain to St. Lucia. And with more than 3000 villas to choose from, there's something for every taste. Find yourself close to the action, or nestled away in a rural hideaway. Whichever you choose, adding car hire means nothing is too far. Pick up your keys and no attraction is out of bounds. Our villas are classed as car optional, car advised and car essential. But what exactly does this mean? There's more on each below, so finding your villa with car hire will become that little bit easier. All the amenities you might need are within reach, so with these villas you can decide whether or not you want a car. But imagine being able to venture further afield! Adding car hire to your villa means road trips, driving into the sunset and truly exploring your new surroundings. Attractions and hotspots are within walking distance, but the walk might just take a little longer. Hop into your hire car when you fancy a drive or you’re feeling adventurous. If you’ve woken up with plenty of energy, stretch your legs as you explore. Feeling in an intrepid mood? Then load up the car, set a point of the map and begin your day of discovery. Private, secluded and with picturesque surroundings, car essential villas are a little off the beaten-track. So expect a scenic drive as you approach your villa retreat. It might be through winding mountains, along coastal trails or through quirky towns. All those amenities and attractions might feel a million miles away, but in reality they’re just a short drive from your door. 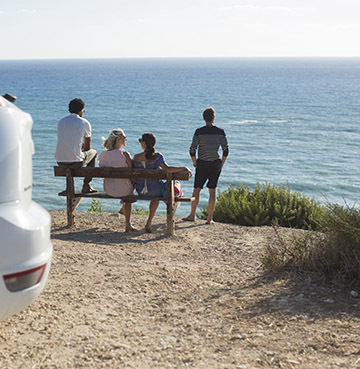 Finding the perfect hire car for your villa holiday is easy. You may need a sat nav to guide you to all those untouched sights, or booster seats for your little ones, which are available with selected cars. We'll take care of all those holiday extras. And with unlimited mileage, there’s no limits on your yearning to explore. The freedom of having your own car will make your villa holiday that extra bit special.